With Valentine’s Day right around the corner, we are so excited to kick off our first annual Looks of Love contest sponsored by Ibiza Food & Wine Bar! There is nothing sweeter than reading a love story and seeing incredible photographs that perfectly capture the love a couple has for one another. We can’t wait to see all the sweet pictures and stories from Houston couples! We’ll be accepting Looks of Love submissions over the next three weeks (deadline to submit is Monday, February 5) and will announce our winner on Valentine’s Day, Wednesday, February 14! The lucky winning couple will be treated to a chef’s dinner for two at Ibiza Food & Wine Bar by the amazing Chef Charles Clark. 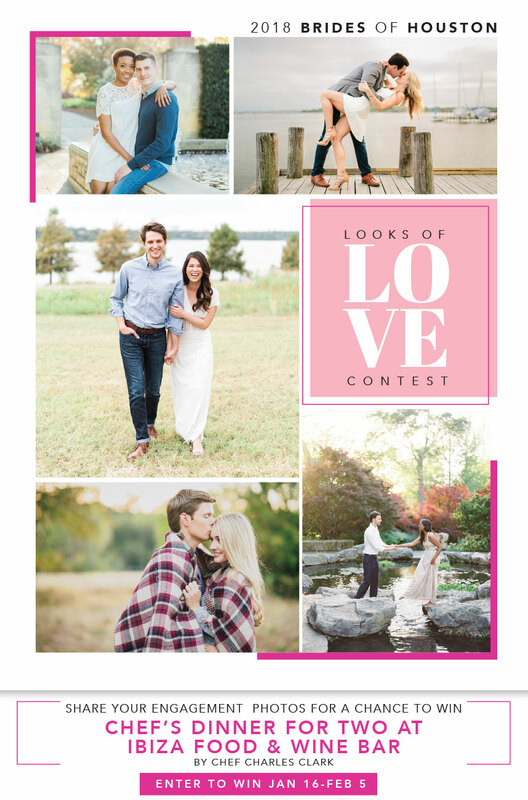 Click here to enter the Looks of Love Contest – simply upload a few of your favorite pictures or engagement photos and briefly tell us your love story. We’ll be sharing our favorite submissions with our followers starting Wednesday, February 7, to help us decide the winner. Good luck!